Hillary Clinton privately told supporters this year that she would likely scrap a major upgrade to the United States’ nuclear weapons program, according to leaked audio of her remarks. At a private event in McLean, Va., in February, Clinton revealed that she would likely cancel plans to upgrade the nation’s cruise missile arsenal. “I certainly would be inclined to do that,” she told a questioner who asked about rolling back the Long Range Stand-Off (LRSO) missile program. Audio of Clinton’s comments at a gathering of major campaign supporters in February were revealed by hackers who breached the email account of a campaign staffer. 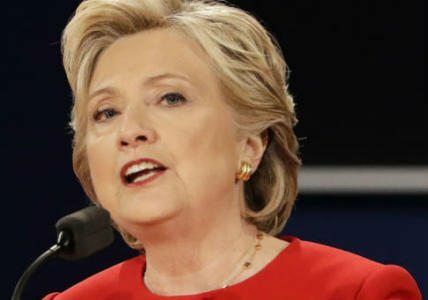 One email released by the hackers contained a recording of Clinton’s remarks and a subsequent question-and-answer session. The LRSO question came from Andy Weber, a former assistant secretary of defense who oversaw the Pentagon’s nuclear weapons programs. He and William Perry, who served as secretary of defense under President Bill Clinton, called for the cancellation of the LRSO program last year. “Will you cancel this program if President Obama doesn’t in the next 11 months and lead the world in a ban on this particularly destabilizing, dangerous type of nuclear weapon?” Weber asked at around 39:00 in the recording. Clinton said she would be “inclined” to do so. “The last thing we need are sophisticated cruise missiles that are nuclear armed,” she said. Her campaign did not respond when asked if her position has changed since then. Canceling the LRSO program would be a major break from Obama administration policy, which has placed significant emphasis on the missile as a key component of its wide-ranging efforts to modernize the U.S. nuclear arsenal. About 1,000 LRSO missiles are scheduled to replace the Air Force’s Air-Launched Cruise Missiles (ALCMs) by 2030. The ALCM program has formed a key component of U.S. nuclear deterrence policy since the early 1980s. The Air Force released long-awaited requests for proposals from defense contractors in July. It estimated that the government will pay $17 billion for a new arsenal of LRSO missiles, though critics have pegged the cost at as much as $30 billion. Emails released by the State Department in response to Freedom of Information Act requests show that Clinton was briefed on aspects of the LRSO debate while serving as secretary of state. Clinton has appeared unfamiliar with details of the Obama administration’s plans for nuclear weapons modernization in statements since then. Clinton avoided a straight answer when asked about those plans at a campaign event in January, but expressed skepticism. “Do you oppose plans to spend a trillion dollars on an entire new generation of nuclear weapons systems that will enrich the military contractors and set off a new global arms race?” she was asked. Former Air Force launch officer John Noonan disagreed with Clinton’s opposition to the LRSO program and other aspects of the Obama administration’s nuclear modernization efforts. But he is skeptical that Clinton will actually follow through on that opposition. “There’s been tremendous advancements in Russian and Chinese cruise missiles, coupled with an atrophy in American capability,” noted Noonan, a former Jeb Bush campaign aide critical of both Clinton and Republican presidential nominee Donald Trump.